In the district of Hertfordshire, 27km north east of London is the city of Watford, where in 1881 Henry Grover founded the Watford Rovers football team; today Watford Football Club. Initially, at the end of the 19th century, the members of the club were amateur players. In the 1886-1887 season the team formed part of the FA Cup, and today competes in the Premier League, the most important English football competition and one of the most important at a global level. 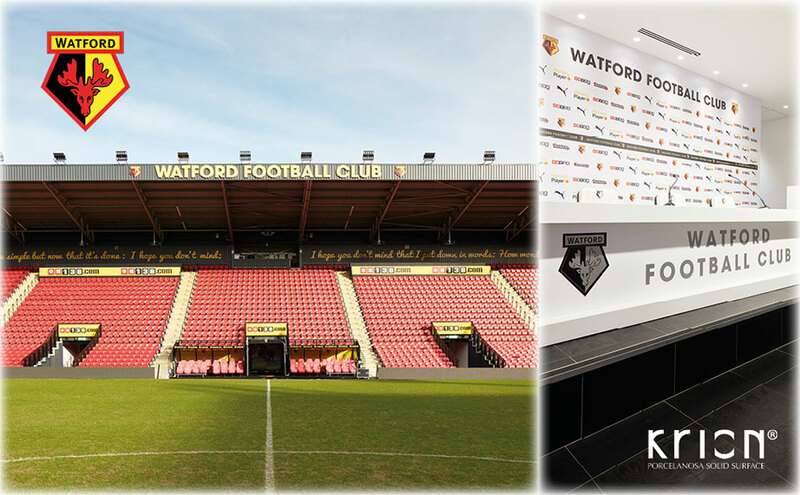 In the last year, its Vicarage Road stadium, with capacity for 20,000 people, has undergone a renovation in which PORCELANOSA Group has participated. Butech, with its construction system, Urbatek with its ultrafine technical porcelain covering the exterior of the stadium along with Ston-ker by Porcelanosa, with Venis is present in the covering and flooring, bathroom fittings by Noken, Gamadecor and of course, our compact mineral KRION® in the press room, reception and bar of the VIP area (the latter with the logo of the club in a backlit low relief).